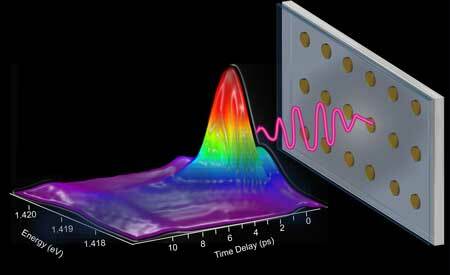 (Nanowerk News) A new study shows that organic dye material combined with metallic nanostructures can provide ultrafast lasing dynamics with short and rapidly appearing laser pulses (Nano Letters, "Ultrafast Pulse Generation in an Organic Nanoparticle-Array Laser"). ‘We wanted to find out how fast we can turn our laser device on and off. Generating laser pulses quickly can be very useful in information processing and can improve the response of some optoelectronic devices,’ explains postdoctoral researcher Konstantinos Daskalakis at Aalto University. The samples used in the experiments are made out of gold nanoparticles placed on glass and immersed in an organic, light-emitting material. The nanoparticles are arranged very close to each other in a square array. Electric fields localised around the particles result in high field strengths that speed up the molecular dynamics in the organic dye. The electromagnetic fields and the conducting gold particles interact both with each other and the organic dye to generate a directional laser pulse that is ultrafast, one trillionth of a second long. Generating a laser of this kind is promising for all-optical switching and sensing and will potentially improve the speed of optical telecommunications and performance of devices that use light to process information, such as cameras and transistors. Very small nanolasers do not usually provide clearly directional beams. Arranging nanoparticles in an array considerably improves directionality. Such lasers have already been created in several laboratories in the world, but their potential for ultrafast pulses has not been proven before the experiments conducted at Aalto University. Measuring the properties of the pulses is very demanding because of their tremendous speed. ‘The key achievement here is that we have succeeded in experimentally demonstrating that the laser pulses are indeed ultrafast. The lasing occurs in optical modes that are hybrids of light and the motion of electrons in metal. These modes are called surface lattice resonances,’ explains Academy Professor Päivi Törmä. The laser light is first squeezed by the metallic nanoparticles into sub-wavelength dimensions, and then it escapes from the surface lattice resonance modes as a picosecond-fast, concentrated laser pulse. ‘These kinds of metal nanoparticle array lasers are excellent for generating pulsed laser radiation with a high modulation speed,’ says doctoral student Aaro Väkeväinen. The pulse generated from the nanoparticle-array laser is so fast that there are no conventional electronic cameras that can capture its dynamics. The researchers used another laser as a “camera”, taking very fast pictures of the tiny laser. The method is called pump-probe spectroscopy.